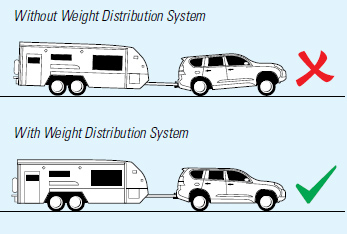 What is a Weight Distribution System? Weight Distribution Systems are designed to assist in restoring the original geometry of the tow vehicle to its natural state. This is achieved through the spring bars providing a lifting force to the rear of the vehicle and transferring the load correctly back over both vehicle axles. 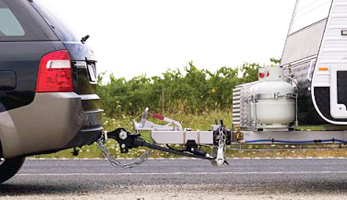 When a trailer is coupled to a tow vehicle, the trailer’s total ball weight is applied directly onto the rear section of the vehicle between the rear axle and towball. Like a seesaw this will transfer the weight from the front and cause the suspension to lift. When travelling this setup can cause unnerving trailer sway, reduced steering and braking responsiveness, less traction and misaligned head lamps. Over time you may also notice a reduction in economy and increased tyre wear. When using the Weight Distribution System (WDS) the ball weight remains the same however the load is distributed through the vehicle’s chassis to all four wheels. By doing this the WDS restores the natural balance of the tow vehicle, restoring the correct suspension and steering geometry, braking efficiency and headlight alignment. All Weight Distribution Systems utilise spring bars to transfer this load through the towbar and onto the tow vehicle’s chassis. Think of the spring bars of a WDS as similar to the handles of a wheel barrow, when raised the weight is transferred forward. It is important that the capacity of the WDS is correctly chosen based on the actual ball weight of the trailer and that the vehicle manufacturer’s recommendations are always followed. 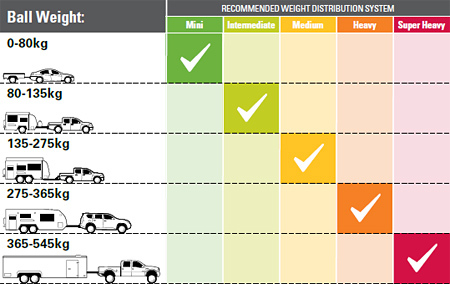 To determine which WDS is most suitable, first weigh your trailer’s ball weight. There are several ways to do this. Generally most modern trailers manufactured in Australia have a ball weight of 10% of the laden weight. Remember to consider everything you put into the trailer including water, gas bottles, food, etc. The laden weight is often underestimated in Australia and this can become a problem when trying to balance your trailer and tow vehicle with equipment which is not up to the task. To get an accurate measurement of your ball weight, contact Auto Extra who can take a quick measurement with specific ball weight scales, or alternatively the ball weight can also be determined by using a weighbridge. Simply manoeuvre your trailer so only the jockey wheel is loaded on the weighing platform with the trailer unhitched from the vehicle. Once you have determined your trailer’s laden weight and ball weight, record these values. See the WDS Setup tab for details on the recording of measurements. Now use the table below to help you select the WDS which is compatible with your laden trailer’s ball weight. Tip: Hayman Reese WDSs work best with genuine Hayman Reese towbars. Some factory fitted towbars are not compatible and need to be evaluated by a Hayman Reese Distributor before use. Not all 50mm by 50mm hitch receivers are in fact a Hayman Reese product, check your towbar compliance label if you are unsure. Please note the references to trailer in the text refer to any towable product. For example caravans, horse floats, boats and trailers. © Copyright Towbars Perth 2019 . All rights reserved.